Those of you who have been following Intents Offroad for a few months would remember the review I did on the Bear Grylls knife by Gerber. If you are new to this blog, you can find it here. The Gerber Machete arrived on my birthday, from the very same family members who gave me the Bear Grylls knife for Christmas. I promptly ran out to the garden with it and removed most of the foliage from my peach tree, used it to open bottles all night and even cut the birthday cake with it. A few days later I got thinking. “I know they get used in zombie movies a lot, but what are the practical uses of a machete?”. And so I Googled it. Now before I go launching into what I learned, I’ll feed you a few straight facts about this tool. The Gator Machete is a total of 25 inches long, with an 18 inch blade on one side, and a 15 inch saw blade on the other. The handle has a rubberized grip with a lanyard attached, and this whole package is housed in a nylon sheath. First impression? Mostly good! The handle is comfortable with plenty of grip, the whole machete is a lot lighter than you might think and it makes a satisfying ‘swish’ when you swing it. The sheath doesn’t appear to be anything special though. It doesn’t look or feel well put together but so far it has performed its task of keeping the blade tucked away when not in use. Rather than putting the lanyard around your wrist, put it around the handle with your hand through it to prevent slipping. To start with, I found an excellent video on Youtube on the different uses for a machete, as well as how to use them properly and safely. I will touch on how to use one here, but if you are interested in furthering your education I suggest you have a look at This Video by American outdoors-man Joe Flowers. I choose to wear gloves when I’m using the machete, for some added safety but mostly to prevent blisters. Being quite a long blade compared to most machete’s means you have plenty of leverage and momentum when swinging it around. The tradeoff for this however is accuracy; it is nearly impossible to strike the same place twice. When slicing with the machete it is recommended that you cut at an angle as opposed to attacking your subject straight on, about 45 degrees should do the trick. Doing it this way requires much less effort, and allows you to slice through thicker material (I can get through branches about 30mm thick with a single well placed slice). The saw does an incredible job! When it comes to anything thicker, it’s time to flip it over and use the saw on the back. I was skeptical of the saw to start with, expecting it to be a bigger version of the crappy little saw you get in a pocket knife. That opinion changed as soon as I gave it a try, sawing through a tree branch roughly 80mm thick in under 30 seconds with surprisingly little effort! Of course it’s all well and good to say how it performed in the first 5 minutes, but what about long term you ask? Well I’ve owned it 5 months or so now, and in that time have taken it along on a few 4wd trips, bush walks and even used it to prune the garden a few times. Throughout all of that I am yet to find any fault with the machete, though at this point in time the blade is due for a sharpen and there are a few small nicks in the blade from cutting close to the ground and hitting hidden rocks. I do know another person who owns this machete and has somehow managed to bend it, I guess that comes down to how hard you are on your tools. So what practical uses did I find from that Google search?, Well, you may have noticed me using it in my previous blog post Jarrahdale 4WD Day Trip to clear the really overgrown sections of the track, and I do keep it handy when out 4wding these days for small track clearing duties. 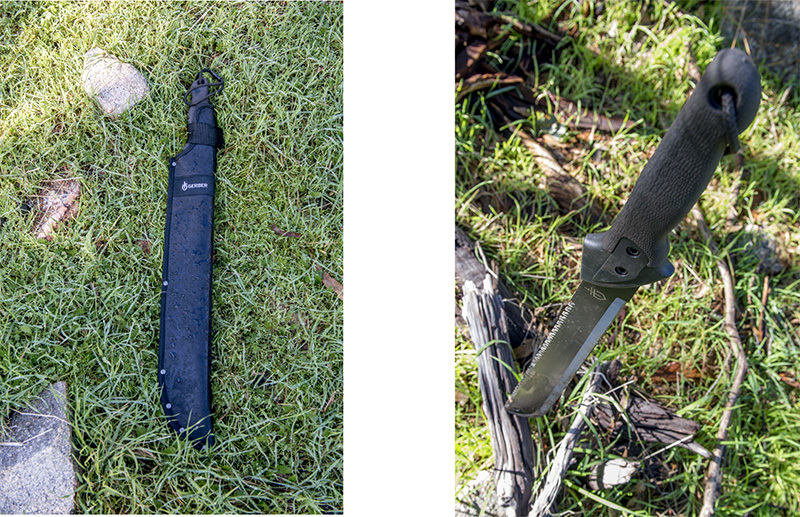 I think the Gator Machete really shines as a tool of the hiker and adventurer who loves to get off the beaten trail, and especially those who like to spend a few days camping on their trek. Use it to clear a path through dense bush and forest, clear a space to camp, cut up firewood, defend against angry wildlife, build a shelter or gather tinder as shown in Joe Flowers’ Video. Finally, my recommendation. I’m sure that Gerber’s Gator Machete would have it’s fair share of critics with those who know and love their knives and machetes, but for those of us just starting out I think it’s pretty hard to go wrong here. You can purchase your Gerber Gator at most BCF stores around Australia, the price currently when writing this article was $76.99. How did it perform on the cake? I had to hold back on the cake a bit. I was worried that I would chop through the cake AND the table!